If my email is any indication, 2019 might produce another bumper crop of new farmers. Those who are finding their way to me for advice come well-equipped with best practices and lengthy to-do lists. Very little of it has to do with making a go of it as a business. My advice is to keep an open mind about the farming industry's sacred cows. Here are five that first-year farmers sometimes spend far too much energy on. Composting is a multi-year process. Segment size production areas will need hundreds of pounds of finished compost. Larger areas, even more. You can start the process in year 1 if you have the space, but you certainly should not feel like a failure if you don't. And you certainly shouldn't aim to meet all your soil prep needs by closing any loops. Other soil natural amendments can be used before your composting gets up to speed, and fine tuning your operation's inputs versus outputs equation can't be figured out in your first year. You can ease into composting with a modest setup which might include four or five 4 ‘ by 4 ‘ by 4 ‘ feet bins. Wooden packing crates you can get for free will get you off to a great start. Seed saving is another worthy practice, but it takes years to develop substantial amounts of seed. Again, you can learn the process and pick up on other's experience, but for your first few years don't create extra pressure by trying to aim to become your own seed supplier. This is an obsession that has grown in recent years. But starting out you should beware of anything that will add complexity to your operation - and structures that require significant expense and specialized expertise make production more challenging. Instead, try extending your season with strategic crop selection - choosing crops that do well in cool weather conditions, timing of plantings, frost tolerance. You will be surprised with how far "simple" growing will take you. Rain water harvesting is another worthy practice, but consider this. Elaborate water harvesting systems can increase efficiency - until they break down or malfunction. And they require investment, specialized knowledge and time to set up. It's better to start simply and perfect more sophisticated systems over several years. Very basic watering methods using only a hose and some hardware store valves is all you need to start. What should be the priorities of a first year farmer? There's only one. Production. You need to develop the ability to grow consistently, in significant volume, at commercial grade. Few master it in year 1. If you also try to make your farm a showplace for all the latest and greatest farming practices, you might never master it at all. And a farm that’s not producing is just a heap of compost. So keep those emails coming. I can pretty much guarantee you'll end up with a shorter 2019 to-do list than what you start with. TO LEARN JUST WHAT YOU NEED TO KNOW, AND DO, TO START A FARM, PURCHASE OUR LEARNING PROGRAM ON TURNING SMALL PLOTS INTO CASH HERE. 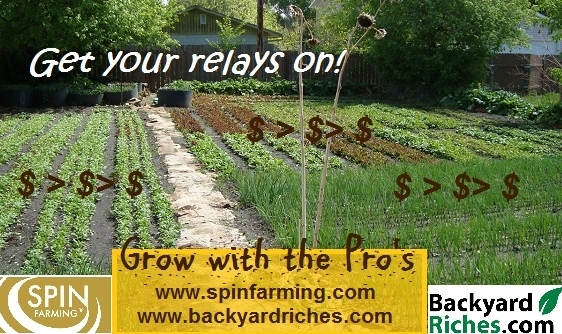 NOT READY TO GO ALL-IN YET, GET A TASTE OF WHAT THE BACKYARD FARMING BUSINESS IS LIKE IN OUR MEMBERSHIP GROUP. YOU CAN JOIN IT HERE.